Based on the warm anomalies of 3.4 being less than they were in December- as mentioned by another poster above- I think we are headed to neutral or possibly even weak La Niña conditions towards the late summer. I think this Atlantic Hurricane Season will be quite active. For me, we’re still too far out in time to even provide a reasonable best educated guess. Come June 1, we’ll have a much better idea of where we stand relative to the state of the important atmospheric and oceanic indicators, and their likely influence on the peak months of the 2019 season. As such, thought I’d share a few interesting continental USA hurricane landfall statistics (dating back to 1851) that are relative to the 2019 season. 1) There have been at least one major hurricane landfall, for three consecutive years/seasons, on 5 different occasions. These periods are 1854-1856, 1898-1900, 1915-1919, 1947-1950, and 1957-1961. 2) There have been at least one category 4 or greater landfall, in three consecutive seasons, on two different occasions. These are the periods of 1947-1950 & 1959-1961. 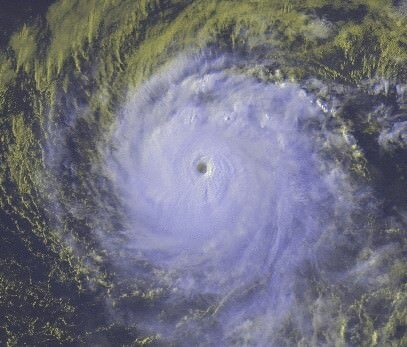 In addition, the 1957 and 1958 seasons each had a hurricane that struck the continental USA as a borderline category three/four hurricane; Audrey in 1957 as a direct landfall and Helene in 1958 as a powerful Cat 4 hurricane that hit the NC coastline with 110 kt maximum sustained winds...while remaining just offshore. 3) Each of the two periods, of at least 3 consecutive years with a category four hurricane landfall, had at least one make landfall somewhere on the east coast of the USA. The Big Question: Will the 2019 Atlantic basin hurricane season produce the continental USA hurricane landfalls required to join, any or all of, the 3 year periods listed above? My take-away is that if there were only 5 (tri-year period) occasions where "3 year periods" occurred having a U.S. major land-falling hurricane occur during each of those years..... that the odd's would seem quite against this from occurring. 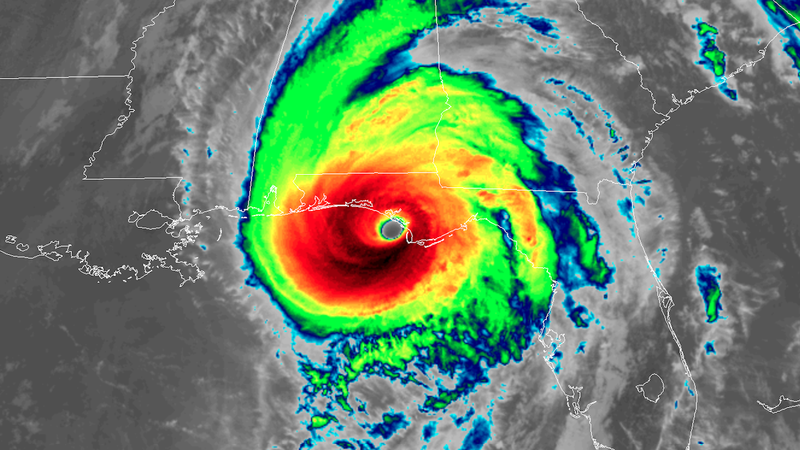 The fact that the prior two seasons did have a major hurricane that made U.S. landfall, would seem to suggest that the odds of this occurring in 2019 would be quite nominal. One could further extrapolate from this, that the 2019 Atlantic Season "might"
2) That the 2019 Season will largely contain storm tracks that remain to our south or re-curving east of the CONUS Of course, this is simply looking at it from a percentages viewpoint (not a scientific perspective). 3) The flip side to the above is of course the possibility that 2019 caps our 6th - 3 year cycle containing years where a major hurricane struck the CONUS in each of those years. I'm presently leaning toward a solution that is a combination of #1 and #2. The irony here is that even if I were generally right, one hypothetical outcome (NOT a forecast) could still be the type of year where there may be a mix of tropical/sub-tropical storms, perhaps only a total of about 10 named storms, 7 of which re-curving "non-landfalls", yet potentially still having 2 Cat. 2 hurricanes that do strike the CONUS. That alone could easily still result in what many would call a destructive season; Just would depend on the size of storm, speed of motion, associated flooding, and other factors. I have released my first 2019 Atlantic hurricane season forecast on my blog at https://www.cyclonicfury.com/2019/03/26 ... utlookmar/. I am predicting 8-13 named storms this season, 3-6 hurricanes, and 1-3 major hurricanes with an ACE Index of 80 +/- 40 units. 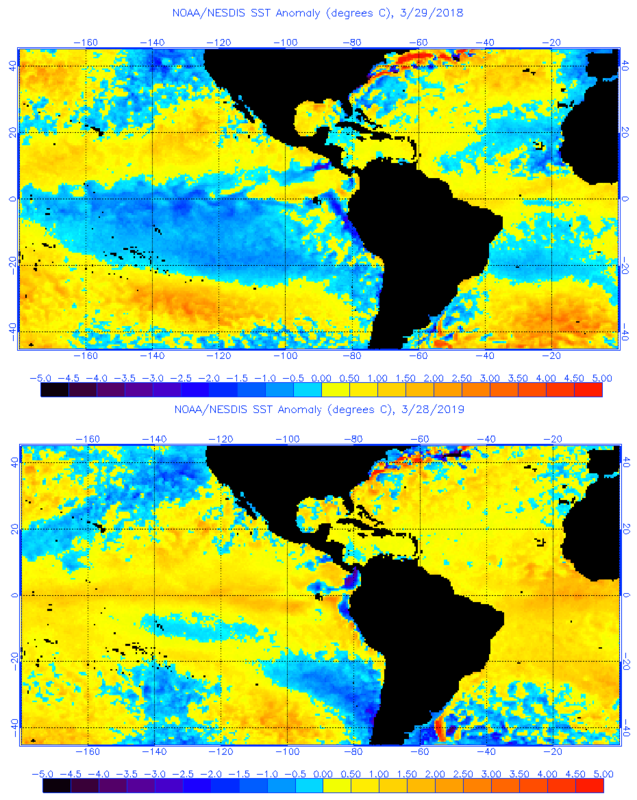 Even with an El Niño the SST’s in the Atlantic are warmer than they were this time last year. This worries me a little, also there is some chatter of 1969 being an analog which for anyone who doesn’t know it featured Hurricane Camille along with 18/12/5 in terms of numbers. TheStormExpert wrote: :uarrow: Even with an El Niño the SST’s in the Atlantic are warmer than they were this time last year. This worries me a little, also there is some chatter of 1969 being an analog which for anyone who doesn’t know it featured Hurricane Camille along with 18/12/5 in terms of numbers. More worrisome is the sheer number of major hurricanes that developed in 1969. 1968-1969 was a moderate El Nino that weakened into a weak El Nino for 1969-1970. I don't know a great amount about El Nino, but with the current conditions, it looks like the Nino could strengthen or stay steady through the summer. I think we're dealing with a different evolution of ENSO which could have a significant impact on how active the ATL is. With the way the ATL is looking in regards to SSTS, I think the thing to consider would be steering patterns. If waves/storms can make it north of the islands and find a sweet spot between 20-30°N, I think it can have implications on how many hurricanes/ majors form for the ATL. If the Nino is strengthening/peaking during the summer months though, I think it'll create fairly persistent hostile conditions across the deep tropics/Caribbean sea, limiting the number of storms that can blow up down there. We saw that last year with storms struggling and dying out as they approached the Caribbean. The big two last year, Florence and Michael were both higher in latitude to reach their peaks. I think that's what we'll end up having to look for this year as well. Exactly! Even in the Super El Niño season of 2015 we saw Erika nearly threaten Florida but thanks to it moving into the Caribbean shear trap she dissipated. In summary, I'm going with 10 named storms, 6 of those storms becoming hurricanes and 3 of those hurricanes becoming major hurricanes. In addition, I'm forecasting an ACE index of 95 this year. I identified the following analog years which seem to be a close match to 2019. They include 1953, 1955, 1961, 1963, 1969, 1976, 1977, 1984, 1986, 1990, 1993, 1997, 1999, 2014 & 2015. (4) South Florida, the Florida Keys & The West Coast of Florida. Opinion on these possible replacement names? This Water Vapor Movie at the time April New Moon is showing a narrowing of influence of Sahara Dust. Water vapor is a key component of tropical cyclone development and as the percentage of total planetary cloud cover increases the probability of cyclone development increases. Hey Luis I didn't know where to kick off the Storm2k 2019 North Atlantic Hurricane Season Poll, but here's my take on a heavily back-loaded 11/5/2 season where most of the activity will likely occur between early September and early November. I think that overall MDR activity will be nominal and most storm tracks will likely occur north of the Lessor Antilles and east of the CONUS. 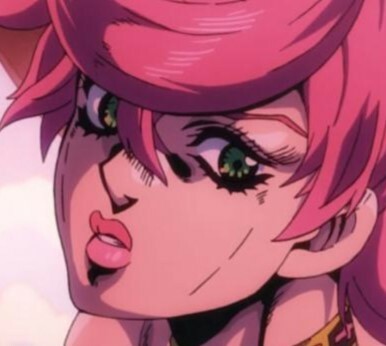 Last edited by chaser1 on Tue Apr 16, 2019 2:24 pm, edited 1 time in total. chaser1 wrote: :boog: Hey Luis I didn't know where to kick off the Storm2k 2019 North Atlantic Hurricane Season Poll, but here's my take on a heavily back-loaded 11/5/2 season where most of the activity will likely occur between early September and early November. I think that overall MDR activity will be nominal and most storm tracks will likely occur north of the Lessor Antilles and east of the CONUS. Regardless, I anticipate that 2-4 tropical cyclones could ultimately pose a risk to Cuba, Florida, the Bahamas, Bermuda, and the Mid-Atlantic Region (with perhaps a lesser risk to Texas as well). This may obviously apply to the El Nino thread however I'm really perplexed by the distinct area of extreme Eastern Pacific cooling. In the face of fairly uniform (albiet mild) El Nino conditions across the Pacific, there seemingly is a pool of equatorial cooler waters in the far Eastern Pacific off S. America. From the graphics that I'm looking at, this looks to step from an Antarctic source where a very narrow band of below SST's seem to stretch right along western S. America and flowing northward to the equator. I wonder if this alone might be contributing to what some are suggesting about this El Nino event possibly shifting to a more Madoki type. Could this far eastern feed of cooler waters be deep enough that it could degradate the Eastern extent of overall Pacific equatorial warming. If so, could this alone have much if any distinct impact on wind flow entering the Caribbean and Southern Gulf through the various levels of the atmosphere? It would seem that on an overall global scale a region over the far E. Pac would seem to be way too small to impact broad-scale Atlantic hurricane season pattern change. Unless of course there were any chance of a more rapid East to West cooling (to ENSO neutral) of a significantly larger region of the Pacific. chaser1 wrote: This may obviously apply to the El Nino thread however I'm really perplexed by the distinct area of extreme Eastern Pacific cooling. In the face of fairly uniform (albiet mild) El Nino conditions across the Pacific, there seemingly is a pool of equatorial cooler waters in the far Eastern Pacific off S. America. From the graphics that I'm looking at, this looks to step from an Antarctic source where a very narrow band of below SST's seem to stretch right along western S. America and flowing northward to the equator. I wonder if this alone might be contributing to what some are suggesting about this El Nino event possibly shifting to a more Madoki type. Could this far eastern feed of cooler waters be deep enough that it could degradate the Eastern extent of overall Pacific equatorial warming. If so, could this alone have much if any distinct impact on wind flow entering the Caribbean and Southern Gulf through the various levels of the atmosphere? It would seem that on an overall global scale a region over the far E. Pac would seem to be way too small to impact broad-scale Atlantic hurricane season pattern change. Unless of course there were any chance of a more rapid East to West cooling (to ENSO neutral) of a significantly larger region of the Pacific.